Ecologically minded brewers come together for a weekend of organic beer at Overlook Park. Grab a Post-It and put a reminder on your computer, your fridge, or your child's forehead: June 26-29 sees the return of the North American Organic Brewers Festival at Overlook Park. The four-day event will feature tastings from 40 different breweries, representing some of the industry leaders in organic brewing. Get thirsty: 58 different brews will be available for tasting, representing breweries from four states and two continents—all of which have been made primarily with organic ingredients. The Scoop: Organic beer is a relatively new movement within the beer community. First started in the 1980s in Germany, organic brewing caught on in the 90s here in America as a response to the growing concern over pesticides and fertilizers in agriculture. Organic beer has gone on to become a $20 million niche of the industry. Many brewers prefer to practice organic ideals because it offers better control as to what goes into their products, and the ecological mindset often goes hand in hand with an artistic mindset, leading many organic beers to hone unique styles and utilize non-standard means of fermentation (one even substitutes lettuce for hops). 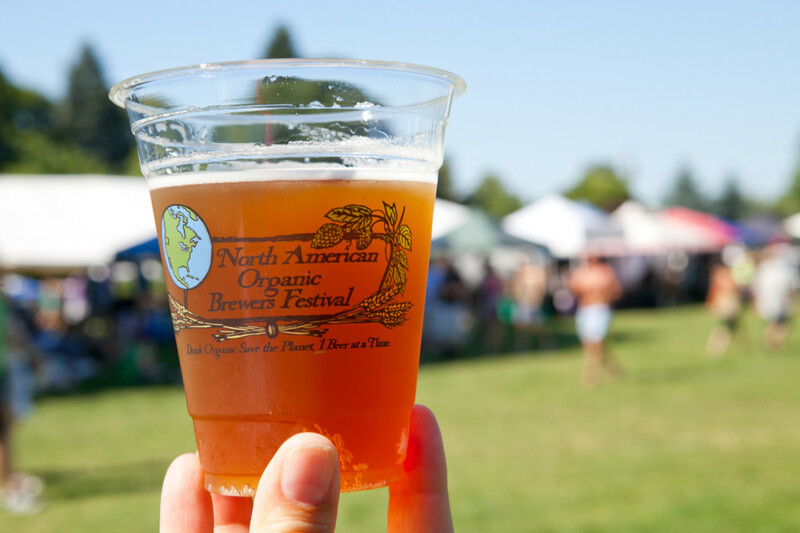 Celebrating its 10th annual fest this year, the North America Organic Brewers Fest draws in crowds numbering in the thousands, all looking to celebrate their favorite brews. The fun starts at high noon on Thursday at Overlook Park, when a $6 reusable, yet compostable, cup gets you the ability to drink, and taster tokens are $1 a piece. More details are available at the NAOBF website. In case the brews build up an epic appetite, food will be available from Bottles, Farm to Fire Pizza, Fifty-Licks Ice Cream, Portland Curry Co, Urban German Grill, and Viva! Vegetarian Grill. In preparation for the event, we’ve highlighted some of our favorite brews that will be on tap. Upright Brewing has garnered a reputation in recent years for inventive, strong tasting beers in the sour or fruit style. The Marble Tulip shows off the best of what they can do. Completely removing hops from the equation, this Amber Saison instead utilizes wild lettuce, galangal, calendula, and white willow bark during fermentation. The result is an intensely aromatic, light and soft beer with fruity characteristics. This unfiltered, high alcohol content Saison is a little to good for comfort. With strong spicy, pear-like crispness, this 8% alcohol beer might just mysteriously disappear from the bottle. Ambacht Brewing is specializes in Belgian style beers that are not too sweet, not too hoppy—just perfectly balanced. The G++ has been aged for 6 months in Hair of the Dog Cherry Adam barrels, which allows it to pick up the flavors of that dark strong ale, while maintaining a golden ale quality. This fruit beer style is reminiscent of a hot August afternoon barbecue. Having gone through a second fermentation on strawberries and rhubarb, this beer boasts a uniquely tart and sweet taste that makes it one of the easiest drinkers of the bunch—sure to please beer lovers and beer haters alike. Check out the full lineup online, and let us know which beers you're most excited about in the comments below!